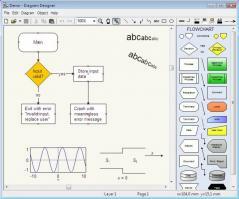 Diagram Designer is a free program that lets you easily create diagrams, slide shows and flowcharts. The program is a vector graphics editor, designed for ease of use that allows anyone to create diagrams, flowcharts and slideshows. It is particularly useful for creating technical diagrams and includes editing and object manipulation capabilities. - Includes a customizable object pallete. - Includes a slideshow viewer. - Supports importing/exporting of JPEG, PNG, GIF, ICO, BMP, WMF, EMF and PCX images. - Lets you plot mathematical expressions using a simple graph plotter. - Includes an advanced calculator with equation solver. - Fully integrated with MeeSoft Image Analyzer to for extended file format support and bitmap image editing. - Allows you to use compressed file format to minimize drawing file size.